Bad News (Opcio K-95), Worse News (Esclaves Salaries), Good News!! The bad news: Opcio K-95 will not be playing their shows in Potsdam and Göttingen this weekend. Very sorry. Even worse news….Esclaves Salaries are now officially broken up. Sadly, the constraints of work and other responsabilities made it impossible for the band to continue functioning as they would have liked it to, and so instead they chose to dissolve it. So, while there will be no final tour, we are still desperately trying to get a hold of the recorded and ready final album of theirs and release it. But since bad news without good news is no good…we had originally planned a 7″ split between Esclaves Salaries and Opcio K-95 with unreleased songs from both bands. For obvious reasons, Esclaves Salaries are no longer on it. That said, we have found a very worthy replacement in the form of Brixton Cats!!! The artwork is almost ready (the necessary changes are obvious, I believe), and we should have it in our hands in the next 2-4 weeks. Red vinyl, 500 copies limited, numbered, and with original artwork! 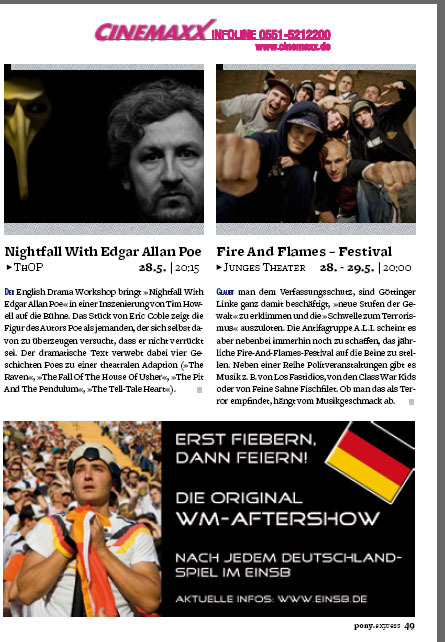 Du browst gerade in den Fire and Flames Weblog-Archiven nach dem Monat Mai 2010.